Surviving is important, no doubt about it, without it we have no chance of thriving. Recently, my husband, Tom, that guy who has Amyotrophic Lateral Sclerosis, ALS, went through a difficult illness and surgery. ALS alone is challenging enough, add on sepsis and gallbladder surgery within days of each other after an umbilical hernia repair a month prior to this and you’ve got some serious problems on your hands. There is a lot to learn hanging around with Tom. He consistently leads the way on living life to the fullest, in whatever capacity that is at any given time. Last week when he was in pre-op he was chatting it up with his surgical team offering to paint them a Van Gogh like painting, actually he said he offered to forge a Van Gogh if they want one. He was 100% accurate in his assessment of himself. Tom came to painting, or painting came to him, difficult to tell which one it is, a long time ago after he survived a serious brain infection. He could no longer function at full cognitive capacity which meant he was unable to continue working in the insurance industry in New York City. Among other issues he suffers from executive function impairment as a result of the infection. As a young man of 38 years old he refused to allow this to define him for the rest of his life, enter painting. Not just any painting but oils, and with a palette knife. For people with an intact cognition, and a modicum of talent, it would take a few years to be reasonably good. 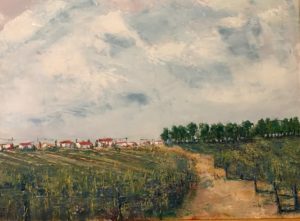 For Tom it has been decades of effort, tenacity, and learning the same thing over and over and over again to be in a place where he can say with confidence, he can paint a good Van Gogh rip off. Long ago he decided because he survived this infection, he owed it to God, to himself, and to his family to be a thriver. To prosper and flourish instead of merely surviving day to day. After he received a diagnosis of ALS he chose the same path. He joyously rode his motorcycle until he couldn’t anymore. We built a house not far from the beach because that is what we always wanted to do. He continues to paint because he can despite the physical limitations ALS rudely puts on him. Some incorrectly label this therapy for Tom. Painting is life for him. It is how he breathes. This last round of health challenges imposed a physical toll on Tom. I doubt we will see him sit around with the cloak of surviving wrapped around him. History tells me he will begin thriving anew. I can’t wait to see what emerges.